Walking into Lunaria is a bit like walking into a magical fairyland. Sure there are some practical luminaires but your sensiblities are amused by everything else. Unusual sculptures and materials, shapes you havn’t seen and objects you never thought could be illuminated. It truly is a feast for the sensibilities. 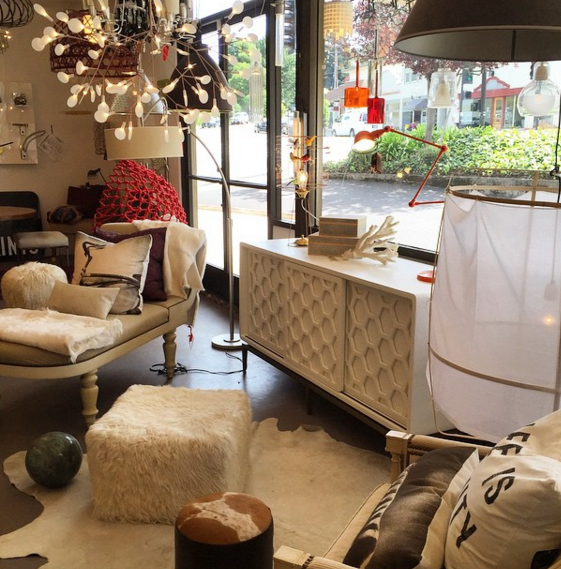 Beyond lights, there are some great accessories and furniture pieces on display and for sale. We have found adding these other elements to the space makes for a more enjoyable viewing experience, a warm and cozy place to be. With 2 distinct locations in Corte Madera and Berkeley and few duplications from one store to another there really are a lot of fun and varied directions. But let’s get practical, after all this is not a trip to the museum, most people come in actually looking for a light. Once you catch your bearings the work begins. If you are lucky a seat will be available at the counter so that you can discuss your situation and needs with a lighting expert. Both Alia and Ian bring design savvy and experience to the table along with some practical knowledge and steps that guarantee a successful installation both functionally and aesthetically. There is nothing better than getting what you are looking for where a light is concerned. Something that fits the space by being the right size and style but also A light that functions like you need it to function so that you can do what you need to do. On the website there is a hot link called “How to prepare for your visit” this asks some key questions and lets you know what to bring when you come by. the conversation begins with our unique back and forth this helps bring lighting candidates to the table. Using our large screen display we turn the typical paper catalogue into an interactive web experience bringing to life the 2-D images with larger scale renditions and additional image sourcing. Often a Pinterest board is set up just for you with options so that you can look at everything in one place. In some cases, we even superimpose a light fixture into your very own room.